There’s a lot happening at the Museum this week, including PNC’s Grow Up Great Mobile Learning Adventure and a colorful exhibition by Warrington Colescott. On Saturday, September 11, PNC will bring their Mobile Learning Adventure to the Museum from 10 a.m. to 2 p.m. The Mobile Learning Adventure (MLA) is part of PNC’s Grow Up Great program. The event will feature activities for parents with children including interactive kiosks, the “What I Want to Be When I Grow Up” photo station, crafts, and educational materials. PNC’s Grow Up Great Day will also include $2 off Museum admission for parents, a Museum scavenger hunt, and vouchers for a free kids meal in Café Calatrava. 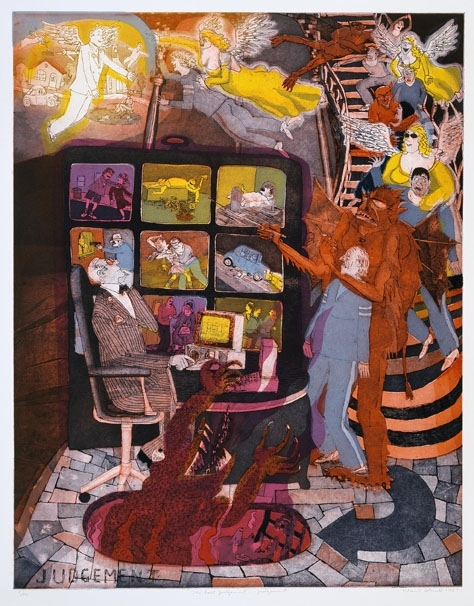 Warrington Colescott: Cabaret, Comedy & Satire is currently on exhibition in the Contemporary Galleries through Sunday, October 3, so don’t miss this bawdy, audacious, and colorful exhibition of outrageous screenprints by a brilliant satirist. Finally, if you are interested in becoming a Museum volunteer, check out one of our information sessions this week, Thursday, September 9, at 5:30 p.m.
For more about what’s going on at the Museum, check out the Calendar of Events at mam.org.